Very close to the Ramanathaswamy temple in Rameswaram we passed a large idol of Ganesha on a truck. Since we visited Rameswaram at the beginning of the Ganapati festival, this was not unusual. What made me stop was the drumming. A group of boys was ranked in front of the idol, wearing a white dhoti and a purple angravastram, playing a staccato rhythm on drums. It was loud, and the rhythm was not very complicated, but it was clearly the first act. 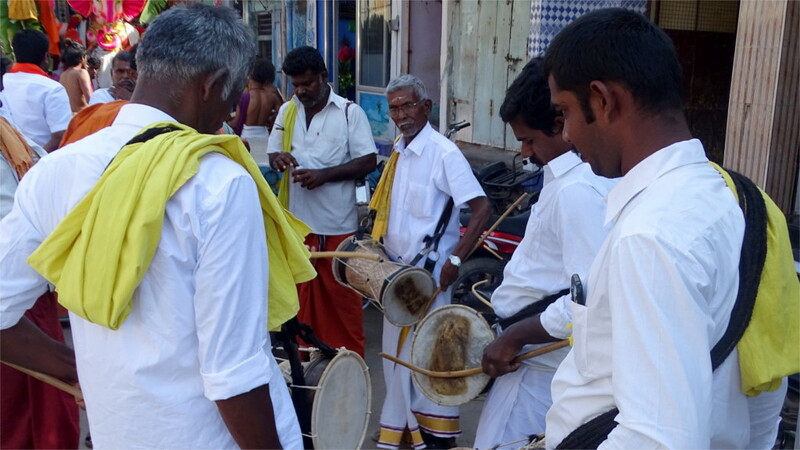 Behind them were older men with a yellow angavastram, with drums. I waited for them to start. It was a treat when they did. I discovered a wonderful new sound, made by rubbing the curved stick across the stretched membrane of the drum. Note the oldest man in the ensemble (at the center of the photo above, facing the camera). If the colour of the angavastram is anything to go by, then he was clearly special. He was absolutely focussed on the music, and seemed to be directing the others. The drums are an announcement of an approaching event, and my guess was that this was merely the start. It would be some time before the truck moved, and the drummers would move behind it, announcing the approach of Ganesha. Rameswaram is a temple town, centered on the ancient temple of Ramanathaswamy, which is another name for Shiva. Every few centuries a layer of gopura (gates) was added to the core temple with the shiva lingas. No cameras are allowed inside. We walked through the famous corridors, gaping at the long painted outermost corridor lined with statues. Then we passed into the next circle; no plaster and colour here, only finely carved stone. The carvings were finest and most exuberant in the innermost layer. Later in the day I was at the western gopuram while the setting sun shone on it. This was a wonderful sight, I thought, as I took the featured photo. In this wonderful light I could zoom in on the clay idols which decorate the gopuram. At the top is a gigantic representation of the mythical Makara. This recurs in the rest of the structure as well. But the different layers of the structure contain well-modeled human figures. I could see elements of the Ramayana depicted here. The uniform golden colour of the gates of this temple are unusual. This style of decoration is followed in smaller temples. 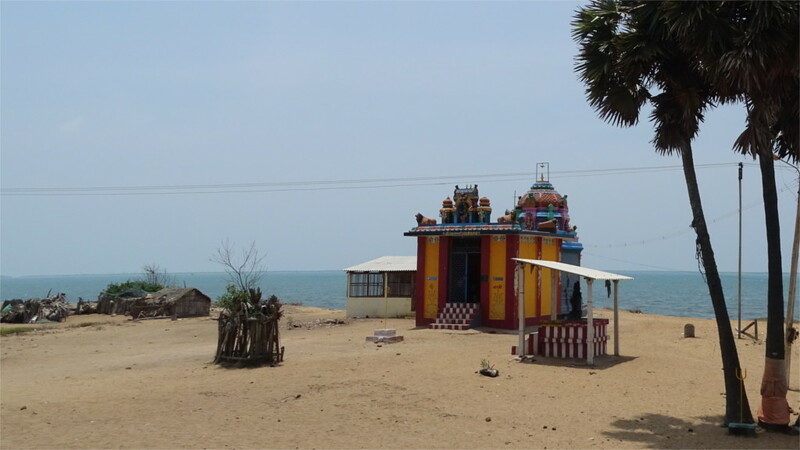 At the edge of Rameswaram town, on the way to Dhanushkodi, we saw a temple to Nayaki Amman. The gate was simple: two pillars with a beam laid across it. This is a modern temple, so the gate was made of concrete, with baked clay idols put over it as decoration. The bright colours are characteristic of south Indian temples. The female figures on the pillars are modelled pretty well, although I found it difficult to tell because of the foreshortening. The figures over the beam are less well done. On the way to the Pamban bridge I saw this lonely but bright temple on the sea side. In the bright sulight it looked like it could have been the subject of a painting by an Indian De Chirico. Coming closer, I realized that it was a temple for Kali. I’d begun to recognize the red and white stripes as a sign denoting a temple. There was no one around, except a person who tried to sell us sliced fruit. The clay figures decorating the spire above the temple were clearly the work of an amateur. Parvati, Ganesha and Murugan were done fairly well for an amateur. They stand in wooden poses, but are not misshapen. The lions, on the other hand, are clearly done by an artist who has never seen the animal. I would see such extremes in temples through the rest of the trip. As always, the quality of the work depends on whether you are able to pay for the services of a good artisan. Today is the 150th anniversary of the birth of Gandhi, but I don’t have any Gandhi memorabilia to write about. Instead I have a photo of the memorial to the 11th President of India: A. P. J. Abdul Kalam. He started as an engineer, became the chief of ISRO, and after retirement was elected the president for a single term in 2002. When the memory of the Mahatma is fenced into the little boundary of keeping your house clean, it is good to break out of it to look at the country which he was partly responsible for creating. This is a country in which the son of a fisherman could become a president. Kalam is buried in Pamban island, a few kilometers from the site of the house where he was born. We walked through the memorial built around his grave. From outside the building looks blocky and closed, but the corridors inside with enclose little gardens. From inside the structure is full of light and air, not at all like its forbidding facade. I wish I could find out which architect designed it. 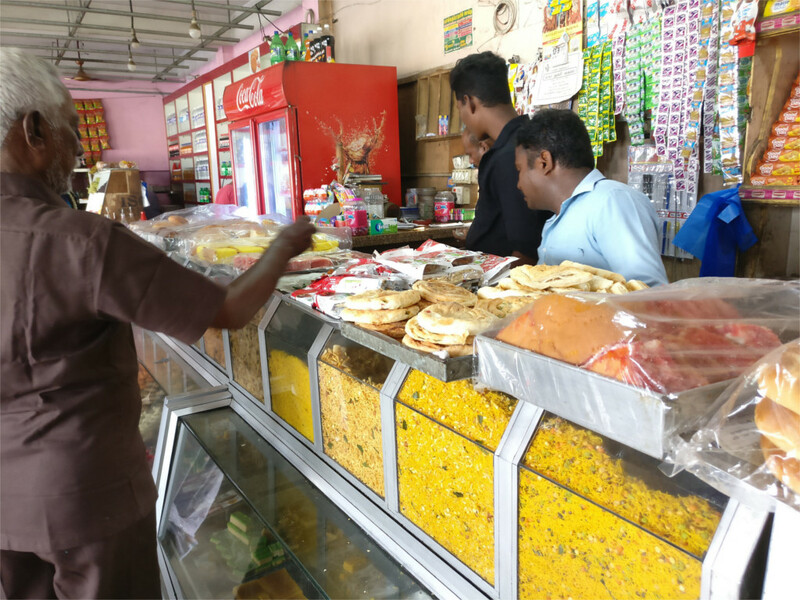 The area around the Ramanathaswamy temple in Rameswaram is full of shops, and some of them are open fairly late at night. I liked roaming these streets trying to take photos of people going about their lives. It is amazing to think that in the 7th century CE the Skanda Purana listed the temple and the Agni Teertham ghat nearby as holy places which one should go to. The island would have been a couple of kilometers out to sea. Getting here would not be as simple as it is today. The temple of Rameswaram has grown in the last 14 centuries. I counted three layers of corridors around the central shiva linga. The outermost was created about three centuries ago. By the looks of the sculptures on the next corridor in, it must have been made about a millennium ago. Life around the temple would have been recognizably similar through these centuries. Shops would have sold flowers for pujas, others would have keepsakes. Electricity came in the last century or slightly more, before that there would have been oil lamps. The shops would have huddled as close to the temple as possible. It was interesting to walk here at night trying to imagine how the place could have looked a thousand years ago. Whenever I travel soutwards into the Indian peninsula past where it narrows to about 600 kilometers or so, I spend a lot of time in admiring the change in colour sensibilities. Southwards the colour schemes on houses are similar to those on the wonderful south Indian silk sarees that you see. When I was younger and less exposed to differences between people, I would find some of these combinations jarring. Now, I can’t stop photographing them. The Family is quite as much into this hobby as I am. Between the two of us we got a range of houses in Rameswaram: from multi-story family houses to little huts. They all have bright colours and interesting gates or doors. Many of them have the traditional kollam outside the door: a new one every day. As always, you could click on any one of the photos in the panel above to go through a slide show. The two kilometer long railway bridge which you see in the photo above is India’s longest sea bridge, and was completed in 1913. It spans the channel which separates the island of Pamban/Rameswaram from the mainland. I was lucky to be near it when one of the few daily trains from the island crossed the bridge. After seeing a photo in a post by a fellow blogger, I looked up its impressive story. When it was designed in 1911 by the Scherzer Rolling Lift Bridge Company of Chicago, the design was very new. The central span of 88 meters (which you can see in the photos here) are designed to roll up in order to allow ships to sail below. In this century it has been expanded to take modern broad gauge rails, and strengthened to withstand the corrosive salty winds which blow across the Palk straits. The cost of building a bridge like this a hundred years ago must have been considerable. The fact that it was completed in tandem with a port in the drowned town of Dhanushkodi points to commercial interests, all very well documented. At the tail end of the period of European imperialism, when the bridge was built, commerce between India and Sri Lanka was immense. The attempt to connect Dhanushkodi to Mannar in Sri Lanka by a 21 kilometer long causeway or bridge was slightly too ambitious for its time. The solution that was adopted was to have a high volume port in Dhanushkodi and a railway link from there, over this bridge, to Chennai. That solution lasted till the cyclone of 1964 destroyed Dhanushkodi. 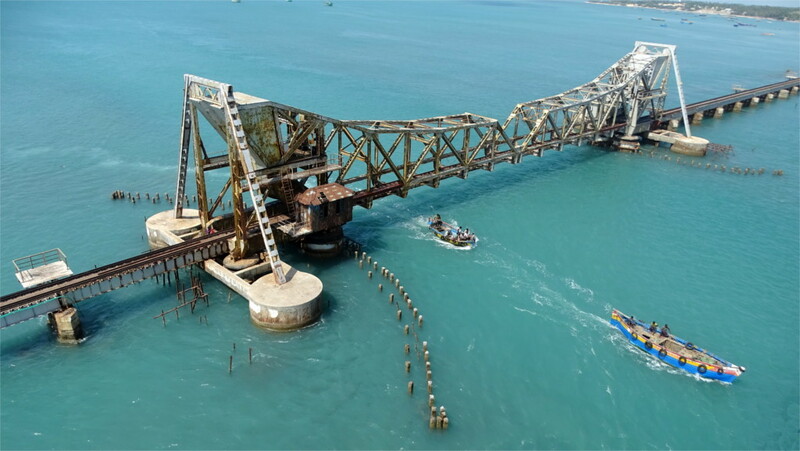 The Pamban bridge is no longer a vital economic link, but it remains as an interesting piece of engineering history, still beautiful, and in use. We reached Rameswaram later than we’d expected. 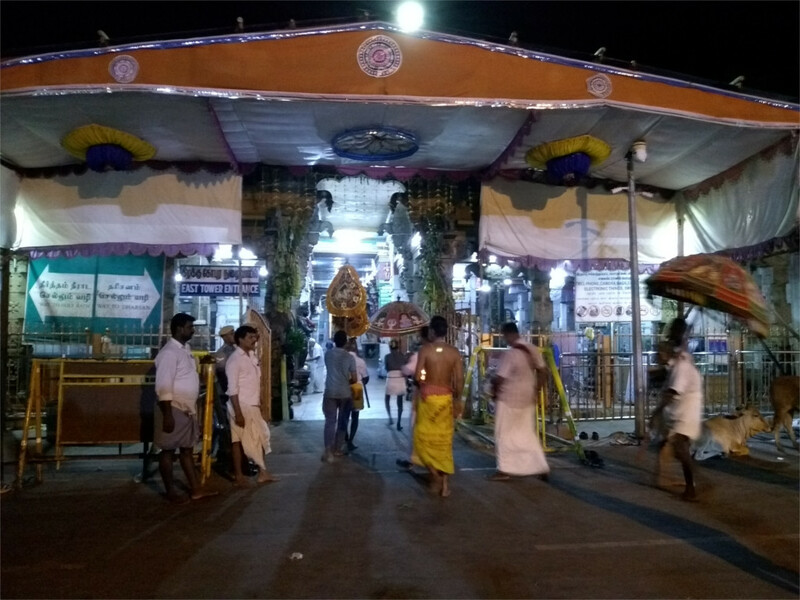 It was fairly dark, and the market around the Ramanathaswamy temple was clearly shutting down. On the other hand, it was the first day of the Ganapati festival, and there were pockets of crowds. We checked in to our hotel, and were out in no time for a circumambulation of the temple. The highest towers of south Indian temples are the entrance gates, gopuram. In the featured photo you see our first view of the temple: the north gate at night. We walked eastwards, towards the sea. Since the east gate is the most auspicious entrance, if there was any activity at this time, we expected it to be there. We saw little. The bazaar was almost closed. I talked to the security at the gate about what I could take in (almost nothing) and turned to go when a well-decorated elephant slipped by. It was over before I could take a photo. But behind it was a long procession. 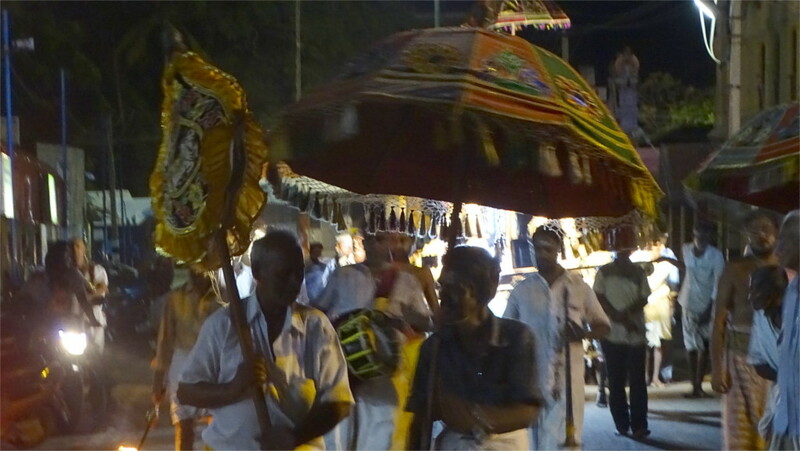 A nadaswaram started up as the procession neared the gate, along with its accompanying drums. A crowd of umbrellas was advancing towards me down the street. I hadn’t expected anything as interesting as this! The musicians and umbrella bearers took up position at the entrance, and I had a clear view of the center of the procession. The movement halted for a while, and I had a good view of the main attraction. 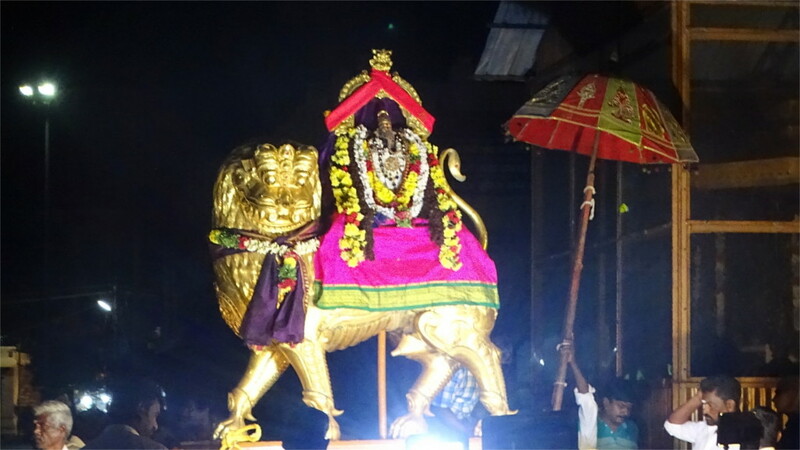 This was an idol of Ganesha mounted on an enormous lion. The idol seemed to be made of copper, and the lion was probably made of brass. Although the mouse is most often shown as Ganesha’s vahana, a lion is also canonical. He is said to have inherited it from his mother, Parvati. But this is uncommon enough that this was the first time I’d seen this representation. A crowd had gathered to watch the procession. I saw many other cameras out. The Family had taken up position across the road from me. This turned out to be a better place to take photos from, since she had the light at her back. The photos she took with her mobile phone were sharper than mine, for example that of the priest as he enters the temple (above). I was closer to the action, but shooting against the light. 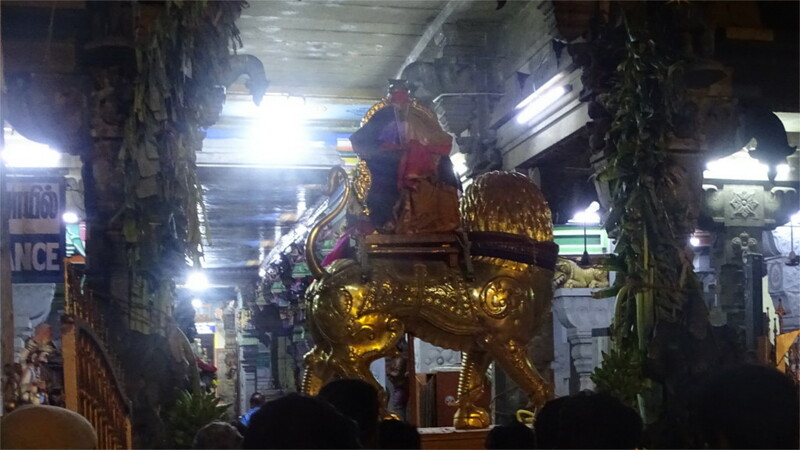 Finally the attendants positioned the cart so that the wheels could turn in the right direction, and smoothly and without fuss the procession turned into the famous east-west corridor of the temple. Since photography is prohibited inside, this was one of the few opportunities I had to take photos of the corridor. We were happy that instead of flopping into bed we’d counted on Ganesh chaturthi being a special event and come out for a walk. Everything had gone well. We missed all traffic in Mumbai because we had to reach the airport in the middle of the morning on a holiday. It was the beginning of the Ganesh festival, but it was too early for crowds. The flight was on time. Sathiamoorthy was waiting for us at the airport in Madurai with his car: a clean and well-maintained little thing, just right for the two of us at the back. We were on the highway almost immediately. 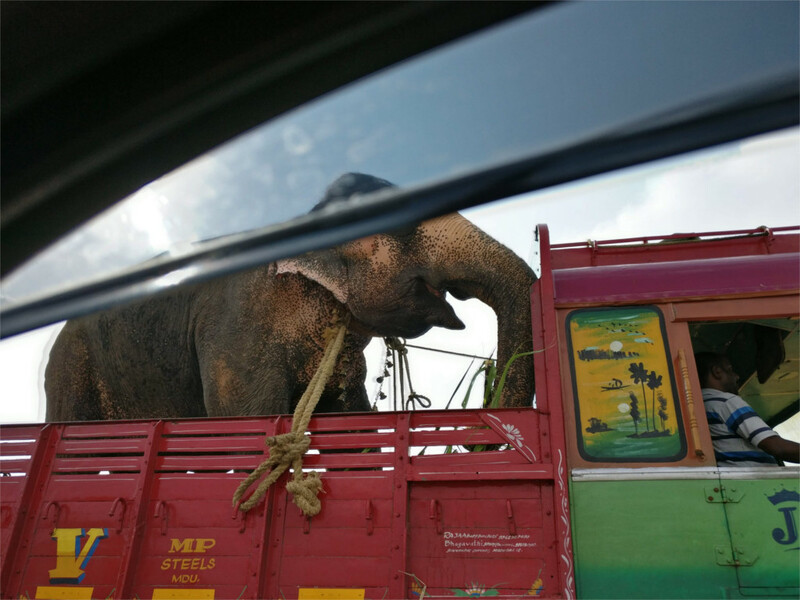 Before I was prepared for anything to happen, I saw one of the odd sights that trips usually hand you: an elephant riding a truck. I fumbled for my phone and took a bad shot as we passed by. What was it doing on a truck. Tame elephants just walk from one place to another. Maybe this was being taken too far away for a half day’s walk. It didn’t look unhappy with its situation. We zipped along, and I was fairly sure that we would reach Rameswaram in three hours, just after sunset. Our luck ran out soon, as we hit a road block. Tamil Nadu has been in a political turmoil recently, with two major party leaders dying. Parties have to keep spirits up in such situations. 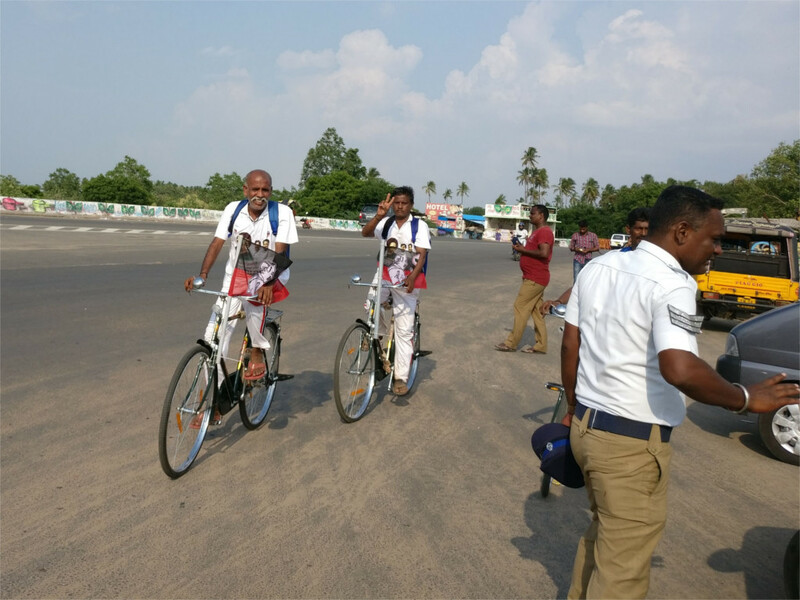 One party had a campaign in which workers cycled from village to village. They were going to use the same route that we planned to use; so the roadblock. We had to wait until the whole cavalcade passed. The police and the political workers were a friendly lot, so I managed to take some photos. The Family decided to make use of the stop to get some coffee. Right at the crossing there was a small highway food stall. The usual small snacks, tea, and coffee were available. I looked at the goodies on display and got a hundred grams of wonderfully crisp ragi murukku to go with the coffee. The filter coffee is always the star of the show in Tamil Nadu, and this place was no disappointment. The piping hot coffee was poured into a small cup in a meter long stream for each of us. The aroma, the sweet milky taste, and the jolt of caffeine wake you into the beginning of a holiday. Unfortunately we were delayed by a couple of hours between the roadblock and a detour. We reached Rameswaram late.